EL PASO, TX—JANUARY 14, 2016—Longtime New Mexico veterinarian Dr. Sidney T. Zarges, 80, passed away on January 8th in El Paso, Texas. Dr. Sid was born in Raton, New Mexico on April 12, 1936. His father was Henry W. Zarges of Cimarron, New Mexico, and mother was Alma C. McDaniel of Roswell, New Mexico. Dr. Sid married Sue Schroeder on Sept. 12, 1958 in Monte Vista, Colorado. The couple graduated veterinary school in 1960 from Colorado State University. They moved to El Paso where they practiced veterinary medicine and opened Zarges Animal Clinic in 1965. They were the first veterinarians to perform equine surgery in the area. 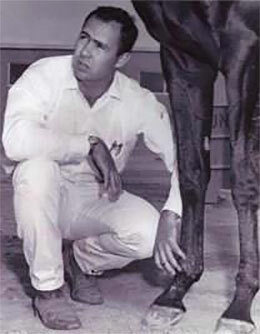 Dr. Sid focused on equine medicine and worked at Sunland Park Racetrack and Ruidoso Downs Racetrack.